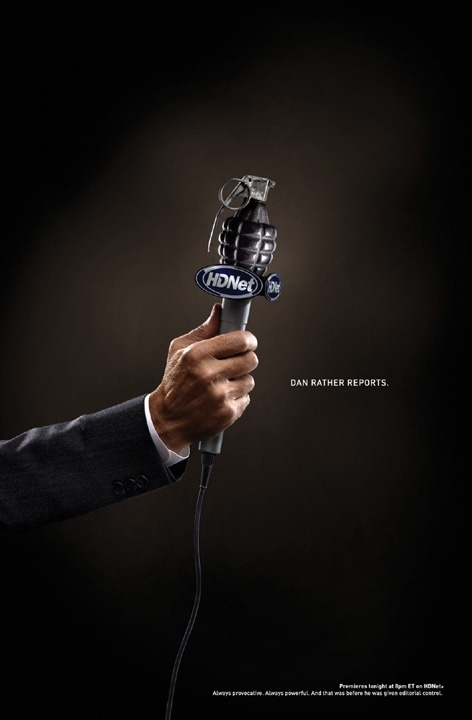 Apparently because Dan Rather's reporting is so explosive or it's what's needed to get anyone to care what's he's doing these days, BooneOakley chose to go with a hand grenade motif in a newspaper campaign to promote the news man's Dan Rather Reports show on Mark Cuban's HDNet. 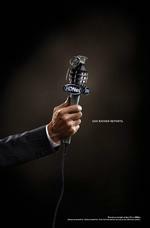 The ads will appear in the Wall Street Journal, USA Today, LA Times, New York Times and the Philadelphia Inquirer. Why can't aging anchors just ride off into the sunset with their final glory intact rather than dwindle away to also ran status on a technology platform the intended demo has likely never heard of nor will ever use? This ad is too good to be real. Did it really run anywhere? I can't imagine that Rather or HDNet actually approved this.